now that the transfer window has (quietly) closed and the theatrics of the world cup are slowly fading into the background, i feel like we can finally focus on what really matters: the football. this would be awesome... if marquez wasn't there. but, let’s be honest.. i love the fluff that comes with it. and here’s the best i’ve come across on the tubes in the last week. if you were take a stroll around say, downtown manhattan, while the world cup final was on this summer, and nothing would have looked any different than any other normal day. thousands of people would still be snapping pictures in times square, buying knockoff purses in chinatown, and strolling about times square. but flash to brazil, and things are clearly different. one man had the bright idea to roll around são paulo during the world cup finals with a video camera. the biggest city in south america was a virtual ghost town. while it’s not surprising that the soccer-mad country would be consumed by the big event, i am a little shocked to not see a single person in the entire clip. which makes me wonder… how the hell is this country going to host the finals in 2014 if no one wants to work during the games? fellow defenders will agree with me when i say that those nancy-fancy forwards always go down for fouls pretty easy. they fall with the slightest nudge, rolling about like someone castrated them instead of a having just suffered a little shirt pull. it certainly doesn’t help that the refs always tend to give those diving bastards the benefit of the doubt. so trust me when i say we defenders have some pent up rage that lives within us all. so when you see a defender lose it a little when they get a foul called against them. but the reaction of the guy in this video, well, i just can’t find the words to stick up for him. landycakes is a moron, and apparently never wants to play in europe ever. why would he put himself in a position where it would be harder for him to move abroad? MLS just made a shrewd move to make sure they got paid when donovan tried to make his eventual move to europe. both thoughts were true, to an extent at least. donovan’s contract extension did nothing but give MLS the upperhand with any potential suitors from the old continent, meaning they could ask for a good deal more money in any transfer moves for the golden egg. landon’s extremely successful loan to everton, coupled with his good performances in south africa, meant that donovan was a hot commodity. don garber’s eyes no doubt had dollar bills instead of pupils at that point. unfortunately, their little plan turned into a giant cockblock. perhaps catching wind of interest from cash-laden citeh drove up their asking price, but america’s pride and joy isn’t worth $16 million. in the end, neither party got what it wanted. great. i love logos… they’re fascinating to me. to me, there is nothing more iconic than an emblem that is instantly recognizable the world over (nike, mcdonald’s, coca-cola; please take your bow). it’s a necessity in this day in age where everything is branded. but the incredibly difficult thing about having a good logo or crest is creating it. i for one don’t mind most teams taking a stab at remaking their image, though it’s insanely hard to create a new identity that is still grounded in tradition. while the article gives credit to arsenal and chelsea for their new crests’ paying homage to their histories, i also think tottenham deserve credit in the same regard. while some clubs make the change very poorly, there are, of course, also clubs like fulham that desperately needed to change, and did so well. the fact that this photo can even happen in this country… boy, it makes me feel like MLS is on to something special. ignore for a second that RBNY might be trying a little too hard to be the new cosmos. 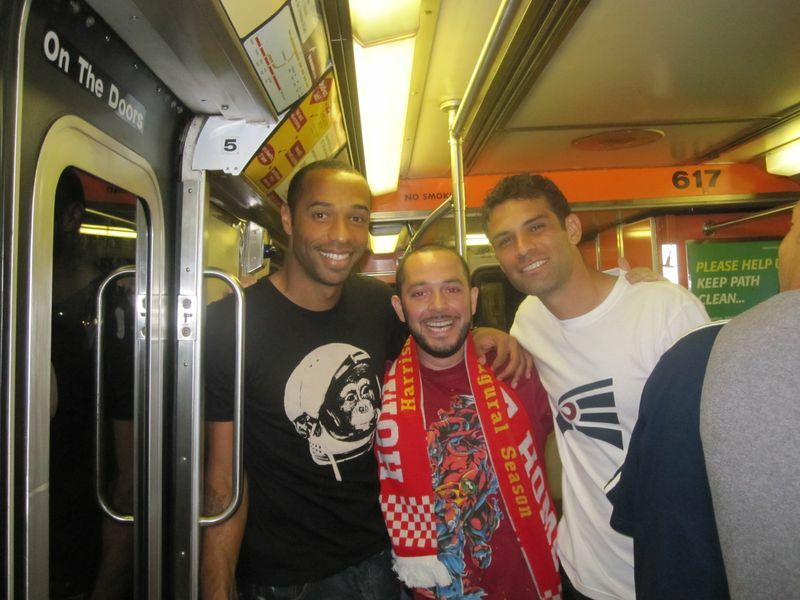 can you imagine sitting next to henry, one of the best players of an entire generation, on the subway? that’s equivalent to sitting next to brett farve or derek jeter, and easily being able to take a picture with them and not get mobbed in the process. please MLS; intelligently ride this wave of awesomeness.